Denise Moore graduated from Cambridge University in 1990 and spent several years mostly in small animal practice before returning to University to pursue her interest in Veterinary Ophthalmology. Denise's interest in this subject arose during her days as a veterinary nurse at the RSPCA Animal Hospital in Putney, London and again during her final years at Veterinary School. Denise ran an ophthalmology referral clinic for the Goddard Veterinary Group in London one evening every week from 1991 until March 2005. During that time she visited many an ophthalmologist and ophthalmology service both abroad and at home and attended many an ophthalmology CPD course. Denise obtained her Certificate in Veterinary Ophthalmology in 1995. Denise has worked as a Veterinary Ophthalmologist now since 1998 when she started an ophthalmology residency at the Royal Veterinary College in London. Denise continued to work at the RVC for a further 5 years initially as a clinical assistant in the ophthalmology service and later as a consultant in veterinary ophthalmology. Denise studied for the Diploma in Veterinary Ophthalmology during her time at the RVC. Denise's special interests in veterinary ophthalmology include cataract surgery and ocular pathology. 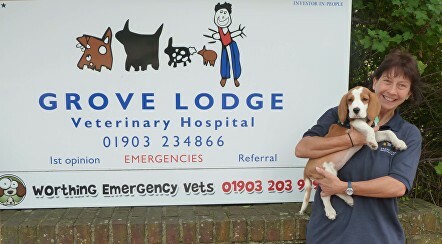 Denise has run an ophthalmology referral service for the Grove Lodge Veterinary Hospital in Worthing, West Sussex since January 2004. The Grove Lodge Veterinary Hospital is a superb location for a referral clinic with easy access from most parts of the country. The nursing team is superbly trained and extremely friendly, the animal care is second to none and the ophthalmology facilities are first class including ERG and phacoemulsification for cataract surgery. Please click here to view Denise's paper on Cataracts and Cataract surgery. Veterinary Surgeons can contact Denise for advice preferably on her mobile 07771 621457 or by email dmoore@veteyes.co.uk at any time. If you are a veterinary surgeon and have an ophthalmic emergency OOHs especially at weekends then please call Denise on her mobile and call our veterinary hospital on 01903 234866. Please also mark your referral form as URGENT. Denise is almost as passionate about the great outdoors as she is about her job and when she is not seeing eye cases she is walking her German Shepherd Dog 'Ellie' or dinghy sailing, cycling and even trying to windsurf! Denise also sings in a jazz band. Take a look at this article written about Denise in the Veterinary Practice magazine November 2013.